We have been providing full transmission service since 1961. We have over 50 years of transmission experience. During a transmission service the transmission pan is removed and the transmission is drained of half of the fluid. The filter and pan gasket are changed and any adjustments are made to the linkage and bands. The disadvantage to this service is that not all of the transmission fluid is changed. If you are looking to have a more extensive service done to your vehicle the transmission flush will replace all of the fluid. We generally do not do transmission flushes. We just remove the pan, replace filter and gasket and add back the amount of fluid that drained out. Flushes are not as necessary anymore due to better fluids. Also it is a come on for certain lube centers and dealers to charge for an unnecessary (and sometimes detrimental service). A Transmission Rebuild includes replacing all failed transmission parts. During the rebuilding process of a transmission the parts that have failed are replaced. Our rebuilt transmissions come with 1 year/ 12,000 miles warranty. Our remanufactured transmissions come with a 18 month/ 18,000 mile warranty. They have the latest technology and are rigorously tested before being installed. 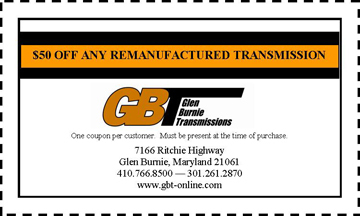 At Glen Burnie Transmission, we have over 175 remanufactured transmissions in stock so we can quickly install the one you need in your vehicle. A remanufactured transmission can be the best option for your vehicle for a slightly higher cost than a rebuilt one. *We also currently sell remanufactured transmissions to automotive repair shops. For more information about our products please contact us on the contact information page or call us at (410) 766-8500 during business hours.